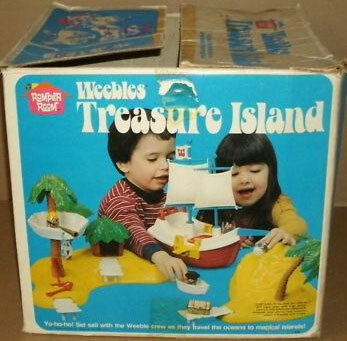 Description: The Treasure Island set is full of adventures! 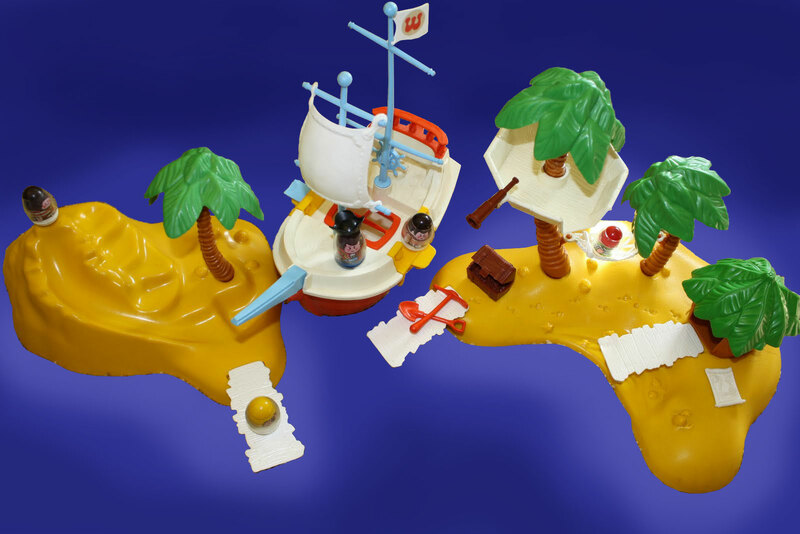 The set includes 2 islands, a pirate ship, treasure map, treasure chest, and four pirate Weeble figures. Island #1 - HTW207 - Island with raised "mountain" area that includes 5 "steps" leading up to a slide. The base has a tunnel hole on the tall "mountain" end, and a tree hole and dock hole on the shallow end. Island #2 - HTW208 - Island with 2 tree holes, a recessed squared area (for the hut), and one dock hole. Large tree trunk - HTW209 - Has a ribbed area near the top to attach the removable crow's nest. One side of the trunk has a triangular "peg" to attach the removable hammock. Small tree trunk #1 - HTW210 - (curved slightly near the top). One side of the trunk has a triangular "peg" to attach the removable hammock. Small tree trunk #2 - HTW211 - (curved slightly near the top). No "peg". 3 each - Leaves - HTW212 - Green molded plastic tree leaf toppers. Each "leaf" is long, like a palm tree leaf). Crows Nest - HTW213 - White 8-sided molded wooden crows nest. Has a hole in the center (to attach to the large tree trunk), and a slightly raised wall on 7 sides (1 side open for doorway). The top edge of two corners of the rail have a small rounded peg (small hole in center of peg) to attach a removable telescope. Telescope - HTW214 - Small brown plastic telescope with a small peg on one side. The peg allows the telescope to balance on the corners of the HTW213 crows nest. 3 each - Docks - HTW216 - Short white plastic molded wooden docks. One end is raised via 2 short round legs on the bottom. 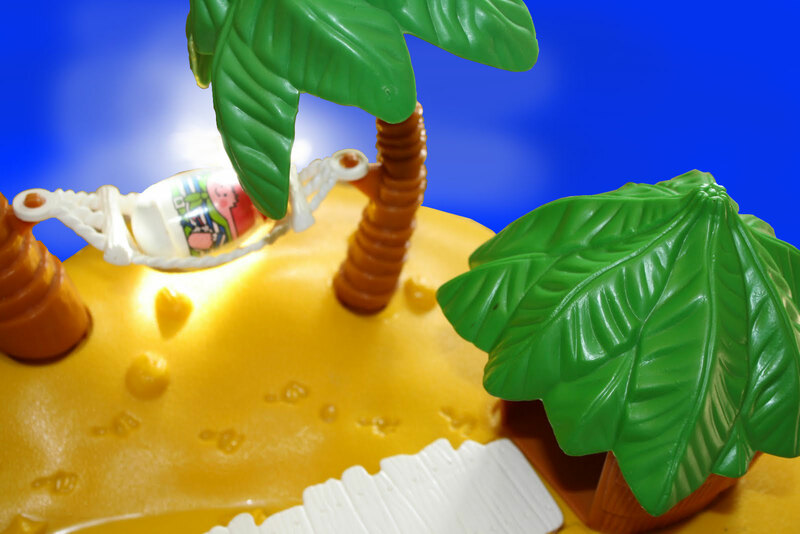 Island Hut - HTW217 - Small squared brown plastic hut with a green plastic "leafy" roof. The hut has a floor, an opening on one side, and the outside walls are molded to resemble bamboo. 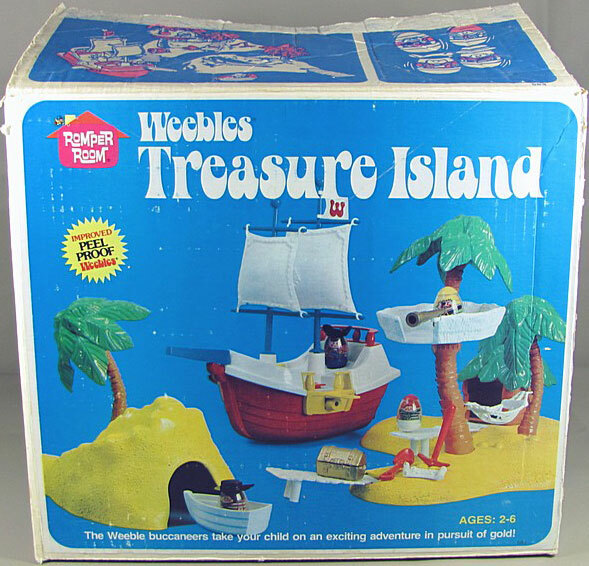 Bottom of the hut is marked, "©1975 HASBRO INDUSTRIES, INC., PAWTUCKET, R.I.
Treasure Map - HTW218 - Small white plastic treasure map, designed to resembled a scroll with map imprints on one side. Treasure Chest - HTW219 - Brown treasure chest with a rounded lid. The lid has a latch on one side and is hinged on the other side. When the lid is open, it reveals a pile of gold coins inside. Shovel - HTW232 - Red plastic shovel with a "loop" handle. Axe - HTW233 - Red plastic mallot axe (flat-head on one side, pointed pick on other side). Dingy boat - HTW222 - Small white 1-seat dingy boat (no movable parts). The sides of the boat are made of 3 layers of "wood" planks. The inside bottom of the boat has a recessed circular area in the center (seat for Weeble). 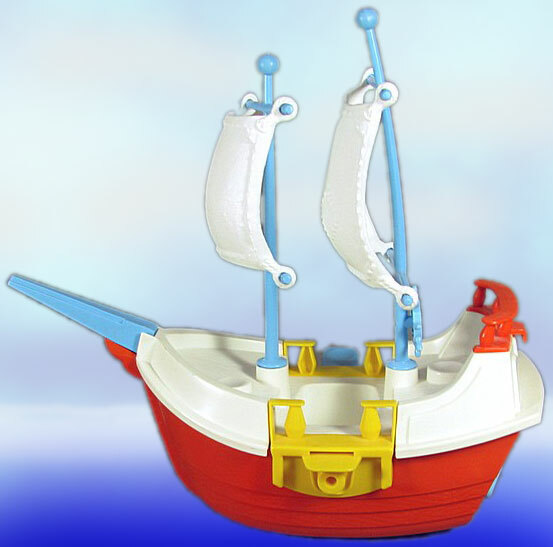 Pirate Ship - HTW223 - Large plastic boat with a red base, white top, and a light blue bow (front "pole"). The top deck has a wood simulated floorboard, yellow side rails, and a red rail across the stern (top back of the boat). Both of the yellow side rails have an opening for a doorway and a molded-in cannon under the opening. One side has a light blue pull-out diving board (gangplank) under the rail opening. Long Mast - HTW224 - Long light blue "pole" with 2 sideways poles (to attach sails). One end of the mast has an attached spoked steering wheel. Short Mast - HTW225 - Short light blue "pole" with 2 sideways poles (to attach sails). Large Sail (Mainsail) - HTW226 - Large square-shaped white sail with a white loop on all 4 corners (to attach sail to mast). The sail is curved to appear as if wind were blowing the sail). Small Sail - HTW227 - Square-shaped white sail with a white loop on all 4 corners (to attach sail to mast). The sail is curved to appear as if wind were blowing the sail). HTW230 - Black pirate hat with raised rounded area in top center and a raised brim. The brim has 3 raised rounded sides. HTW231 - Black pirate hat with a flat top, wide flat brim, and a "ribbon" on one end. HTW17 - Captain Pirate - Blue base, brown top (hair) pirate with a red fancy jacket with gold trim. Holds a blue telescope. The brown top (hair) area has 2 small rectangular holes (to attach a hat). Marked "©1975 Hasbro". HTW18 - Pirate 1 - White base, brown top (hair) pirate with a red/white striped shirt, a brown belt and gun strap across his chest. Has an anchor tattoo on one arm. The brown top (hair) area has 2 small rectangular holes (to attach a hat). Marked "©1975 Hasbro". HTW19 - Pirate 2 - White base, red top (hair) pirate with a blue/white striped shirt, green scarf tied around neck, green belt. Has an anchor tattoo on one arm. Marked "©1975 Hasbro". HTW20 - Pirate 3 - White base, yellow top (hair) pirate with a green shirt, white scarf tied around neck, wide black gun strap across chest, black belt. Has a patch over 1 eye, bird on hip. Marked, "©1975 Hasbro". Featured in 1975 Wards Christmas Book (page 320) - Price $11.96. Featured in 1975 Sears Christmas Book (page 487) - Price $11.97. 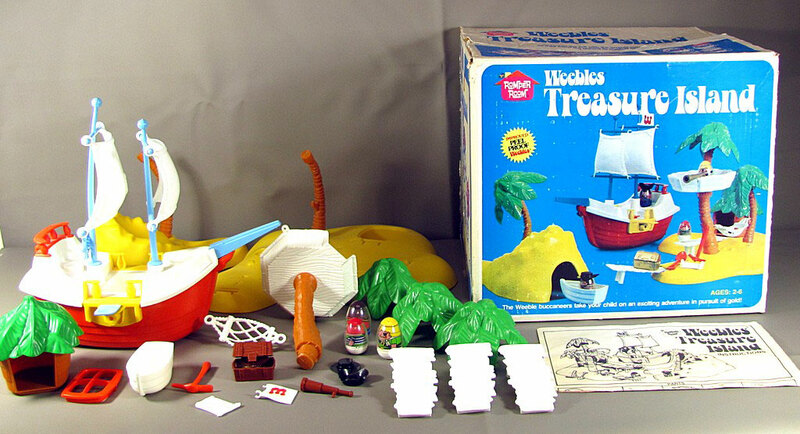 Included in the National Museum of Play Online Collections.